Mental Health First Aid: Older Adults - Ardent Solutions, Inc. Mental illness and aging can often be a double stigma. According to the National Council on Aging, the number of Americans 85 and older will triple by the year 2050 when the youngest baby boomers turn 86, thus, resulting in more than 6 million Americans 85 and older. Older adults and care partners are less likely to identify a problem as a symptom of a mental health disorder. Furthermore, older adults have high rates of late onset mental health disorders (anxiety/depression) and low rates of identification and treatment. There is negative bi-directional impact between mental disorders and health conditions. Even “mild” mental illness symptoms can have catastrophic consequences in vulnerable older adults. The intent is to increase the understanding of the mental health issues affecting the older adult population and to equip Mental Health First Aiders to provide stronger support to these individuals and families. This 8-hour Mental Health First Aid for Older Adults course is designed to help communities and front line professionals better understand mental illness and respond to psychiatric emergencies. 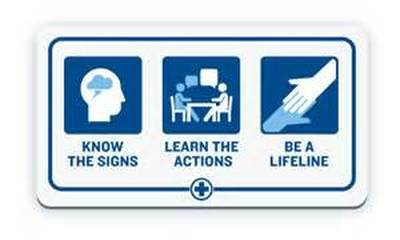 This includes hospital staff, primary care providers, aging services and social service agencies, senior center staff and volunteers, nursing, rehabilitation and assisted living facilities, healthcare providers and home care workers, mental health workforce, faith communities, law enforcement, and other first responders, families and anyone interested in geriatric mental health issues.